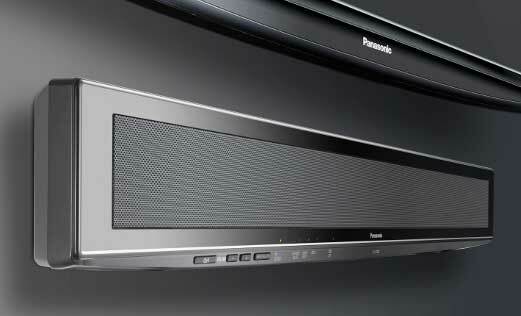 Panasonic have entered the soundbar-type speaker market, with the release of the SC-HTB10. Soundbars work in essence like this. Under the mesh, there is an array of speakers. The array ‘fires’ the sound across the array of speakers, in sequence, which combined with some more electronic trickery, attempts to make a single box produce something akin to surround sound. Some soundbars work better than others, and there is a bit of snobbery about this type of speaker. It is not true surround sound, but soundbars will sound better than pretty much any speaker system built into a TV. That, and they manage to do so in a reasonably small footprint, making them a good choice for small rooms. Back to the Panasonic SC-HTB10. Installation is as easy as placing just forward of the TV, and connecting via HDMI. If you’re looking to buy this, or indeed any other soundbar, do try and give it a listen in a store that has it set up in a smaller listening room, to give you a better sense of how it will perform in your home theatre environment. The Panasonic SC-HTB10 is available in stores now, at an RRP of $399. On my visio tv there are only 4 hdmi inputs? How do you input from a speaker? I was going to purchase a spdif cable or a digital optical cable and try that. Then there’s the Digital Audio Out to use. How do I instAll a Panasonic schtb10 soundbar to a visio tv?